An amazing entertainment package to experience with full HD 1080p quality Dolby Digital video with DVD Disc playback and surround sound system. With Philips HTD5550 enjoy cinema at home. You will get the power to play your favourite movie the way you want. Enjoy every roar of the lion and hear every romantic whisper in the ear. Stream and play online entertaining videos or audios with built-in Wi-Fi. You can also play through your iPhone or iPad. Along with this you also get the karaoke mode to sing along with your friends and family and enjoy the whole night of fun. The speakers with double bass pipes are wonderfully designed and developed to let you decorate your living room and give it an entirely new and trendy look along with brilliant sound excellence. Life was never so interesting! Philips HTD5550 comes with bass reflex system speakers which also contains double bass pipes to enhance and advance the available lower frequencies. This way the speakers provide rock-solid, unshakable and very deep bass to your music. It claims to give you the highest pitch and the lowest pitch sound in a very clear audio frame. Now enjoy loud music at home with no disturbances. Dolby Digital is the world’s prominent multiple channel digital audio standards. Philips HTD5550 is using this technology to give the user an unmatchable video experience. 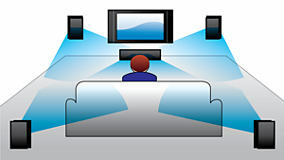 The Dolby Digital is designed to use the sound waves in a way a human ear will process the sound. Thus, it gives you a superb surround sound quality of the audio you are listening to with genuine 3-D cues. Do you like to watch old movies that are in your old CDs and VCDs? Now you have the power to play anything and absolutely anything from your CDs, DVDs, and VCDs. 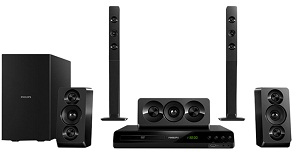 The Philips HTD5550 is a smart Home Theatre system which can play your old discs with simple functions. Watch movies, music videos or your home made videos. It is also compatible with the USB devices. 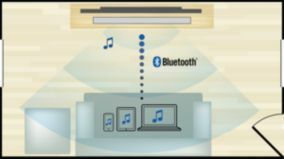 So, you can simply connect your USB device with Home Theatre system and play your preferred file. HDMI is a High Definition Multimedia Interface and as the name suggests it provides high definition video quality. It can carry digital HD along with the digital multi-channel sound. It abolishes the conversion of audio to analogue cues and therefore, provides crystal clear and sharper image and audio quality. 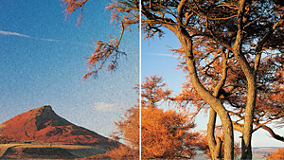 If you have a standard quality video, HDMI will easily transform it in to high definition video. 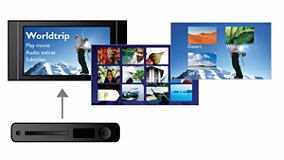 So, now enjoy HD and more lifelike videos at all times with the Philips HTD5550. Are you a lazy person and do not like to get up again and again to pause, play, volume settings etc.? We have some good news for you. 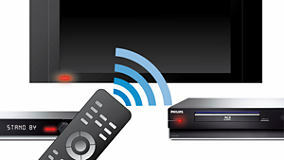 Philips HTD5550 has an application by the name of EasyLink which will let you control numerous devices like Blu Ray Players, television, DVD-VCD Player etc. and all this is with just one remote. 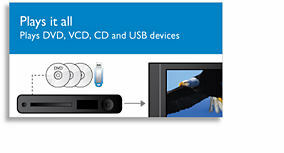 The technique used in this is HDMI CEC industry standard protocol that helps in sharing functionality between different devices with the HDMI cable. Now play and pause with absolutely no pain. DivX support lets you enjoy all the videos that are DivX encoded from the internet. This also includes purchased Hollywood flicks. The format used in DivX is a MPEG 4 based compression technique of videos. This technology gives you the liberty to save large files like video songs, movies, movie trailers etc. on the media like CD-R, CD-RW and DVD. 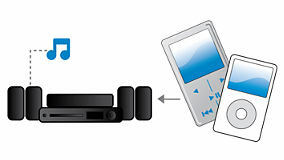 This can later be used for playback on your DivX Ultra Certified Philips HTD5550 Blu-ray and DVD player. It caters important features like multiple audio languages to help you understand it better, integrated subtitles, multiple tracks and menus and all this in one convenient file arrangement. Connect wirelessly with your Bluetooth and stream videos without any hassle. 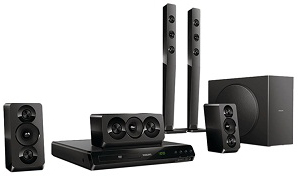 Simply connect your smartphone and pair your Bluetooth device with the Philips HTD5550 home cinema system and enjoy. Philips HTD5550 is a trendy device designed keeping in mind the changing demands of the consumer. The world today is tech savvy, for those who prefer to play anything and everything with an easy application. The application of Audio in allows you the convenience to play your favourite track directly from your iPhone, iPad or iPod. You can also connect your laptop for that matter and enjoy your favourite song. You are advised to connect your audio system to the Audio in jack and enjoy supreme quality of music and sound quality at your home with the Philips Home Cinema. 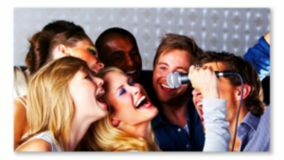 Karaoke allows you to sing along the beats of the music you prefer to listen. You can play this all night with your friends. It is a good time pass for the kids at home as well. They can stay glued with this and you can work without the worry of caretaking what they must be doing. Also, this can be an attraction for the house party you might be thinking to plan soon. It is a way to encourage your home entertainment.